It was a full house at Al-Damma theatre downtown. The dedicated audience sang along and cheered for encores as the talented members of the Tanboura dance troupe chanted their hearts out in celebration of their 30th year in the music world. "This month we celebrate under the slogan, 'come fly away with the music of the canal,'" explained Zakaria "El-Raiyes Zakaria" Ibrahim, as he is referred to by his colleagues. Al-Tanboura troupe was first founded by Ibrahim in 1980, but under a different name: The Port-Said Folk Heritage Troupe. "It was based on the sharp sound of El-Semsemia musical instrument, but after five years I decided to re-introduce the ancient Al-Tanboura musical instrument, and for the first time to play it in concerts rather than it being confined solely to old rituals, and [I] renamed the troupe after it," he told Al-Ahram Online. Al-Tanboura, Ibrahim recalls, is a musical instrument that dates back to the ancient Egyptians. As a matter of fact, it can be found in the Egyptian Museum. It was always confided to temple ritual music because of its deep sounds. "It was also used during the Zar rituals in Sudan, and in coastal Egyptian cities some 50 years ago," notes Ibrahim. "Since 1820, after Mohamed Ali's invasion of the Sudan, and as the Sudanese joined the Egyptian Army, it became quite popular in Egyptian coastal cities that practiced the Zar ritual and continued to do so until 50 years ago." 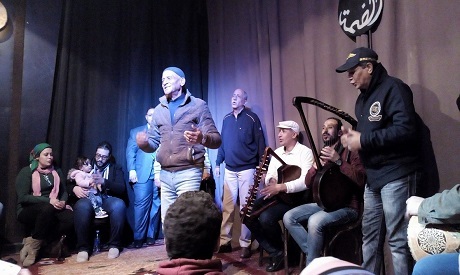 Al-Tanboura troupe focuses on folk songs that document the daily lives of fishermen, the social history of resistance of various wars on Egypt and witty folk love songs. The singers are all males, and the instruments are the basic tabla (folk Egyptian drums), Tanboura and al-semsemia. Al-semsemia, an equally ancient musical instrument, is also found in the Egyptian Museum but boasts comparatively high pitch notes. "Al-semsemia, however, is found and played along the coasts of the Red Sea, left and right, in the canal cities, Ras Ghareb, Hurghada, Shalateen in Egypt, in Sudan all the way to Somalia, in Aqaba, and Yanboa -- it accompanied the fishermen on their sea trips, for it kept the rhythm of rowing and fishing techniques to the extent that the one playing the semsemia was paid full wages like a regular fisherman for spurring enthusiasm among the fishermen," he added. Aiming to preserve and revive folk music, Ibrahim also co-founded the Mastaba Center for Egyptian Folk Music in 2000. Documenting and archiving traditional Egyptian songs, music and musical instruments, as well as the voices and history of Egyptian music were among the center's main goals. Organizing and facilitating educational activities to inform the general public, educate the younger generation, and to encourage a general awareness of the value of this heritage to Egyptian identity was the center's main aim. The performance that roamed the world settled in a little basic theatre, also called El-Damma and created by Ibrahim. El-Damma is a form of singing that was affiliated with Sufi rituals that were practiced in Port Said in the early twentieth century. It included folk, love and ritual songs that portrayed and represented the rituals of everyday life. "In thirty years of music resistance, I have learned that folk songs and love songs and ritual songs documented daily rituals -- hence were called 'damma' -- and were sung in gatherings on the streets," he concluded.